Creative Outdoor Lighting installation in Mesa Arizona and the surrounding areas. We believe at Redwood Landscaping that your outdoor investment should be seen, even at night. Put your property on display and showcase your home with our professional landscape lighting services! Service area includes Mesa, Chandler, Gilbert, Ahwatukee, Tempe, Apache Junction and Queen Creek Arizona. 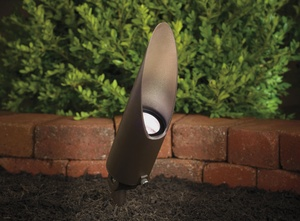 Garden and landscape lighting serves two functions: first, practicality and second, enhancing visual appeal. Many times the subject of lighting is overlook and discounted as an unnecessary cost, however, lighting plays an important role in accentuating the beauty and versatility of your premises. In fact, based on the incredible beauty lighting can add to a landscape or garden we are often surprised that lighting is left off the landscape plan altogether. 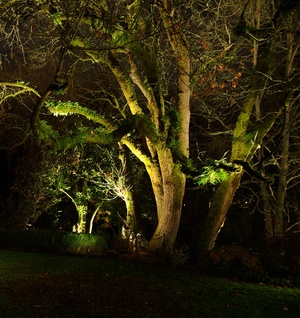 If not left off, lighting is often limited to a few cursory practical considerations that help you see in the dark but do little to enhance, feature or embellish the magnificence of your landscape. This situation is often driven by a mind-set that assumes outdoor lighting is expensive to install and run, and that landscapes are for the day time only. 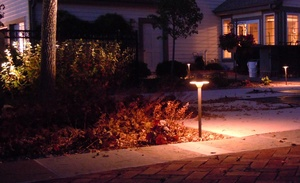 Firstly, modern technology has made running landscape lighting very affordable. LED lighting, low-voltage lighting and solar technology allows you to run quite extensive outdoor lighting relatively cheaply. The use of timers makes function very simple and also adds to the flexibility of running costs. Secondly, a beautifully lit evening landscape creates a feel that contrasts that of the day time. Your night time landscape can be a wonderland where light and shade creates an inspirational vista, magical and engaging, a scene that is simply not possible during the day. Think of the resorts you have visited, strolling the beautifully lit grounds in the evenings. This look and feel is more than achievable in your own garden landscape. Lighting your landscape adds a whole new degree of style and sophistication while complimenting practical function and security. Talk to our technicians and designers today and let them surprise you with a range of lighting options that will add a new dimension to your landscape at a price you will be pleased to hear is less than you might have envisaged. At Redwood Landscaping, we specialize in installing high-quality lighting to create a great outdoor living space for you and your family. Contact us today to schedule a free consultation with our lighting team. We look forward to helping you showcase your home with professional landscape lighting.